I have tried to make this with different methods and I have tried all the patches in this forum without success. I've also tried all the sequencer examples in the library but I just can't seem to find the way to make it work. Any suggestions? Any people here that have succeeded making something like this? if you would write down exactly what makes these sequencers so special, or what functions you need, that could help a lot! how do you plan to input the steps in standalone mode? midi controller? 16 switches? 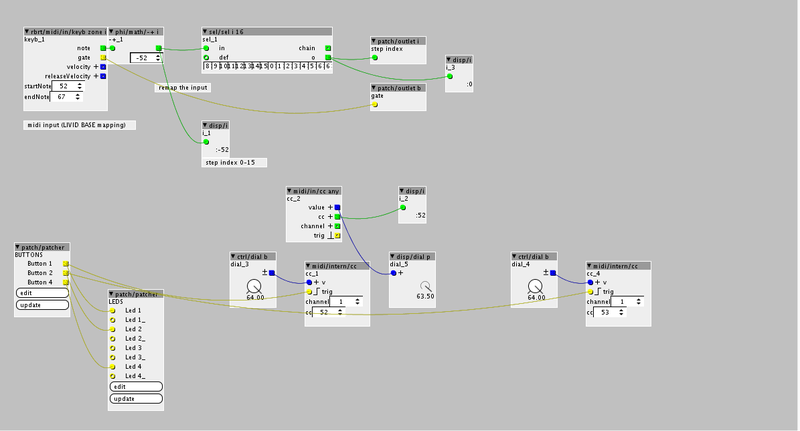 the graphical objects for step sequencers are not the ones you would use for live pattern input. i think @SirSickSik has lots of objects for live midi/control data recording. have you checked out his contributions? Yes that is the question Yes 16 buttons with leds is the way I want to input the steps. The leds would be bicolor so I can have the pressed steps and play head indicator as well. I have fiddled with SSS's objects but I'm not sure what of them to use and how. What controller are you using? What messages is it sending? Let me know and if I get time I'll do a basic patch if I can. I've found tables are the way to go for this. The basic idea is to toggle on and off elements of a table, and then have a separate object that reads it out, controlled by a counter. And for the lights, you have another object that reads the same part of the table and it sends midi messages back to the controller for feedback. I'm gonna build my own controller using teensy 3.6 that sends midi to axo. Then some buttons and knobs gonna be wired straight to axo. The basic 16 step sequencer buttons I was thinking to wire to teensy to send midi to axoloti. Have a look at this, it's an example of how you'd do one voice for a midi controller on the midi din input/output using 16 midi notes starting from note 64. So, you'd have to change where it was sending/receiving from to suit how your stuff is set up, but it shows the concept. @philoop that looks awesome, maybe I can try to make something similar after I get the basic functions working. I was thinking of making it kinda modular so I can add different "modules" (knobs, leds, buttons with their own faceplates) later. @MattilynMattroe thanks I will check it out as soon as I get home. Every answer much appreciated mates! yeah, but that is a "hack" and not really supported (may change in a new firmware, though i don't really know if there will ever be one ) and besides, if you want (as the op seems to) a computerless setup, you don't need the fancy sel-object graphics anyhow, they just eat up precious sram. I tried to understand the patch, it looked pretty simple after few looks. But I just couldn't get the inputs solved. In that patch I got 2 buttons sending cc note: 52, 53.